What if we spend a bit of time in advance and setup the wages properly in Salon Swift so that it’s all done lickity split each week for us? Want to do that? It’s worth it, so if you’re keen, jump into the tutorial below and let’s get setup. First of all head to Menu – Admin – Employees – Add/Edit. Now choose the staff member you wish to set the wages for. In my example, I’ve chosen employee Roger Doorman. Next, select to the Wages Tab. From here, enter in the appropriate wages for each type of day. Their Hourly Rate, Hourly Overtime Rate, Hourly Sick Rate and finally, Hourly Holiday Rate. Be sure to pay attention to Saturday rates or other days that may incur changed wage rates. When done, press Save. That’s step 1 done. Now we need to make sure the staff roster matches what your employee is doing in real life. Here is a quick image showing Roger’s weekly roster. If required, make any changes to your employee’s roster. We need to be sure your correct super/national insurance rate is set. Choose Menu – Admin – System Configure. Set your rate in this screen on the right and press Save. OK, Now the easy part. For the wages report to work correctly, the calendar should match what the employee does in real life. If they’re on lunch, book a lunch break. If they’re on holiday, book a holiday for them. Did they start late today beucase they worked late last night? (Time in lieu). If so, that needs to be entered. 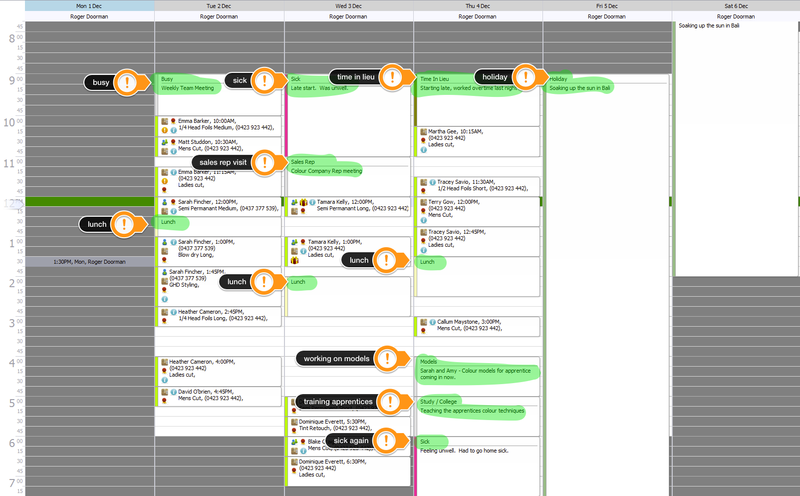 It’s all very simple and visual and is done using the tools you use daily when booking appointments. 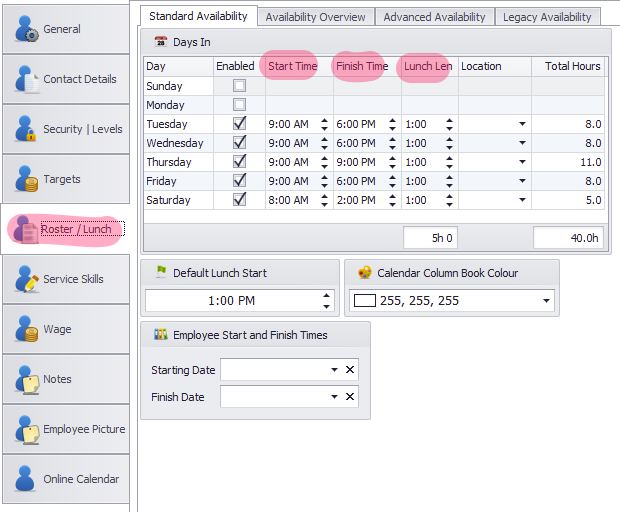 Here’s an image of what Roger’s week looks like in Salon Swift to give an example. Now the fun and easy part. With one click your wages are ready to be entered into your wage software (Quickbooks, Xero, MYOB, etc). First of all, on the options on the right, approve any overtime, sick or holiday pay. If you don’t do this the employee won’t be paid for these. Choose the date rage on the right of the screen to match the date range your after. In my example, I’ve chosen “This Week”. And that’s it! From now on, all you need to do each week is ensure the calendar reflects the week of the employee (be sure it’s their responsibility for it to reflect accurately their week). 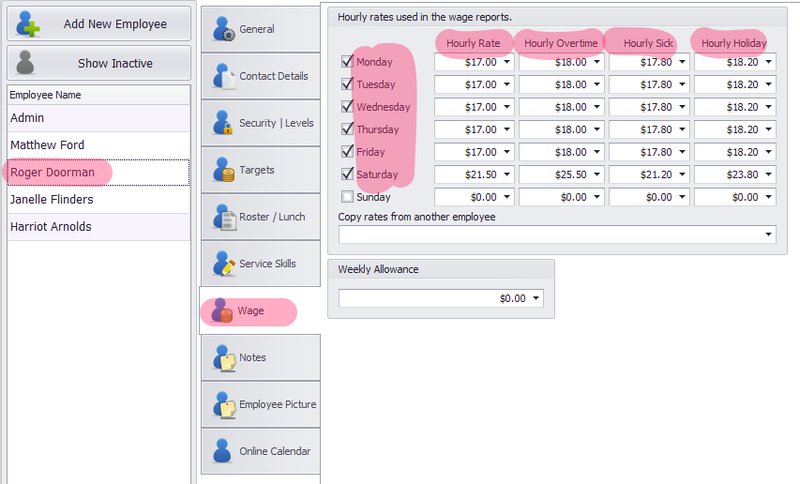 Once confirmed, view the report and enter the data into your wages software. Very quick and painless.